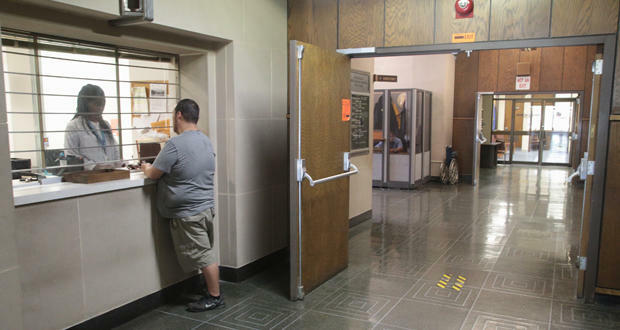 A customer pays a bill at the customer service window at the Oklahoma Corporation Commission in Oklahoma City. Journal Record senior reporter and digital strategist Sarah Terry-Cobo speaks with KGOU's Jacob McCleland. A bill that passed the Oklahoma House on Tuesday would create a task force to evaluate the Oklahoma Corporation Commission. The Corporation Commission is charged with regulating the oil and gas industry, utilities telecommunication, and other industries and endeavors such as the dismantling of cotton gins. House Bill 1377 was authored by state Rep. Weldon Watson, R-Tulsa. Watson says it is time to take a closer look at the agency, and to give those who are regulated by the Corporation Commission the opportunity to suggest changes, according to the Journal Record’s Sarah Terry-Cobo. The State Chamber of Oklahoma and several of its members brought the issue to his attention, Watson said. He said he’s not going after the agency. He said his goal is to improve the agency. Terry-Cobo told KGOU that at this time, only one trade group has weighed in on the bill. Tom Schroedter, who represents Oklahoma Industrial Energy Consumers, has expressed concern. “His members use significant amounts of power for their business. He is opposed to the bill and wonders why legislators aren’t examining any other agency for efficiencies,” Terry-Cobo said. In recent years, the legislature has give the Corporation Commission additional responsibilities - such as regulating ride-hailing services and wind energy - without providing the agency additional funds. Like many state agencies, the Corporation Commission is working with less money that in previous years. Terry-Cobo says a Journal Record analysis found the Corporation Commission’s appropriations have been reduced “by millions” over the last few years. “That’s in part by this creative tactic in which the Legislature borrows money from the agency’s revolving fund and then appropriates it back to them. That makes cuts appear smaller than they actually are. But that money has already been dedicated to projects like plugging abandoned oil and gas wells. That slows work for contractors and potentially creates hazards, by letting old wells sit unplugged for longer,” Terry-Cobo said. Jacob McCleland: Sarah, OG&E originally asked the Corporation Commission for a $92 million rate increase in December 2015. This week, you wrote the commission approved an increase of only 8-point-9 million. How do the refunds come into the picture here? Sarah Terry-Cobo: Well Jacob, the company is still doing some number crunching to determine how much customers will get, but so far, residential rate payers will get about a 72 cent refund each month through December. Each customer class gets a different refund. So those classes are: residential, commercial, and industrial, which would include a large manufacturer or a refinery. McCleland: So customers were essentially overcharged since the middle of last year. Why would OG&E want, and the Corporation Commission approve, an interim rate to begin with, before the new rate was even a done deal yet? Terry-Cobo: A utility might bristle at the word “overcharge.” That’s because state law allows a utility to implement an interim rate after the company has filed a rate case, but the agency has not made a ruling. The deal is that the company must provide refunds if the Commission ultimately approves a lower rate. McCleland: How do wind tax credit play into all of this? It’s a bit complicated, but essentially the Commission approved moving the production tax credits into a different portion of the company’s rate structure. Now those credits go into fuel cost portion. Commission Chairman Dana Murphy says otherwise, customers get the benefit, through lower utility rates. But the utility wouldn’t get credit, which isn’t fair, she says. McCleland: I want to stay on the Corporation Commission a little longer because a bill passed the House this week that would create a task force to examine whether the commission is structured appropriately and funded adequately. Why does the bill’s author, state representative Weldon Watson, belief that now is the right time to do this? Terry-Cobo: He says it is important to determine if the agency meet the demands of modern times. But he admits that the Legislature is partly to blame for the shape the Commission is in right now. They added more responsibility to the agency, like regulating parts of the wind industry and ride-sharing services like Lyft and Uber. But they didn’t give any more money. McCleland: Those new responsibilities go along with what the Corporation Commission has traditionally done, which is regulate oil and gas, utilities, telecommunications and other industries and endeavors … including the dismantling of cotton gins. What’s been the response by the industries that are regulated? Terry-Cobo: Well at this moment we only have one trade group that weighed in on the bill. That’s from Oklahoma Industrial Energy Consumers, and Tulsa attorney Tom Schroedter represents them. His members use significant amounts of power for their business. He is opposed to the bill and wonders why legislators aren’t examining any other agency for efficiencies. McCleland: Who would potentially sit on the task force? Terry-Cobo: As the bill reads now, that would one person from oil and gas, one from a utility, one from the telecommunications industry and one from the transportation industry. It would also include two senators and two representatives. And then the Commission gets to appoint three. McCleland: But there’s no representatives from the cotton gins here? Terry-Cobo: No, they’re relatively small in comparison to these other regulated agencies, even though farmers still produce cotton here in Oklahoma. Most of what the agency does in that area is oversee the dismantling of old cotton gins. McCleland: Like other state agencies, has the Corporation Commission received budget cuts over the past several years? Terry-Cobo: That’s right, we analyzed the agency’s budget and found that their appropriations have actually been reduced by millions the last few years. That’s in part by this creative tactic in which the Legislature borrows money from the agency’s revolving fund and then appropriates it back to them. That makes cuts appear smaller than they actually are. But that money has already been dedicated to projects like plugging abandoned oil and gas wells. That slows work for contractors and potentially creates hazards, by letting old wells sit unplugged for longer. McCleland: Sarah Terry-Cobo is a senior reporter and digital strategist for The Journal Record newspaper. Sarah, as always, thanks. It’s been a pleasure. Terry-Cobo: Great to be here. Thanks for having me, Jacob.